Your home is giving you signs that it’s having electrical issues. Some outlets are discoloured, even blackened. 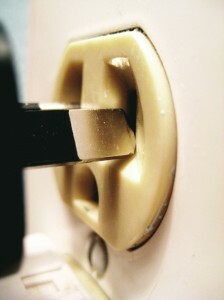 You’ve noticed sparks when unplugging an electrical device or when turning a light switch on or off. A breaker keeps tripping and is not resetting. A light switch has stopped working or lights are flickering. It’s obviously time to call in the professionals but how do you know which electrician to invite into your home? Is there some way to know who to trust? Electricity is NOT a hobby. Put your trust in Apollo Electric. We’re proud to be recognized as a Member of the Electrical Safety Authority’s (ESA) Authorized Contractor Program (ACP) which is a not-for-profit corporation responsible for public safety in Ontario. The Program was developed by ESA to identify those Contractors who consistently perform Ontario Electrical Safety Code compliant work at a level that reinforces public electrical safety. An advantage to hiring a Licensed Electrical Contractor as opposed to a handyman electrician is that the Contractor can take the additional steps of getting the required permits, receiving inspections on work or receiving any necessary safety certificate for the work performed. ESA is working to ensure that electrical installations in Ontario meet the Code requirements of the Ontario Electrical Safety Code. This Code requires that an application for inspection be filed with ESA for any electrical installations and wiring done in your home to ensure your safety. Ontario homeowners continue to put the safety and lives of their loved ones at risk by not hiring qualified electrical contractors. A recent study revealed unlicensed workers cost homeowners’ unnecessary time and money. Almost half of Ontario homeowners allow an unqualified person or contractor to perform dangerous electrical work in their homes despite a law making it illegal to do so. According to a recent Leger Marketing survey, 45% of Ontario homeowners do not find it necessary to check the credentials of contractors before hiring them to perform electrical work, such as rewiring a fuse or breaker panel or adding new electrical receptacles or switches. In addition, more than 70% of homeowners would allow a neighbor, friend or handyman to install a new light fixture for them, while 47% would permit them to repair an electrical outlet and 43% would let them wire an outdoor light timer – all of which are considered dangerous if not done properly. The Ontario Government passed a law requiring all contracted electrical work to be performed by a Licensed Electrical Contractor. The law came into force in January 2007 in response to the increasing number of electrical incidents involving property damage, injury and death. body that administers and enforces these licensing laws. Homeowners’ impulse for hiring unlicensed contractors has cost them a significant amount of time and money. More than one-third of homeowners have had negative renovation experiences while an equal number have had to pay to fix improper electrical work. 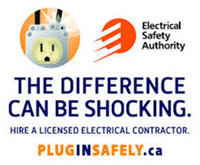 In the last ten years, over 100 Ontarians have died as a result of electrocution. 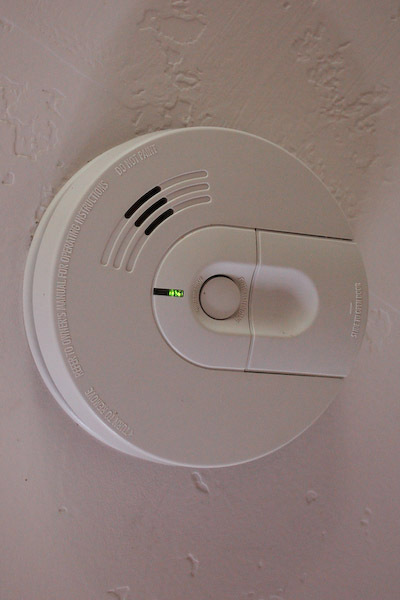 In addition, there have been almost 35,000 electrical fires reported by the Office of the Fire Marshal. Don’t be a statistic of an electrical fire in your home! Ensure your home and the safety of your family is protected from the dangers of an unqualified electrical contractor – Call Apollo Electric Inc. today. Why are these important? For Child Safety! The New Ontario Electrical Code has added a very important addition and for good reason – an average of 7 children per day are treated for injuries due to contact with electrical outlets and 89% of these are under the age of 6. The code now requires all outlets that are accessible to children in new homes be tamper resistant and if an outlet needs to be replaced or if you are changing outlets due to age, that you replace them with tamper resistant receptacles. One of the ways we teach our children is to put shapes into the appropriate holes. 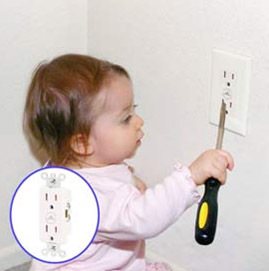 Some children expand on this concept and try to put paperclips, pens, bobby pins, screws, nails, knives, forks, keys and many other metal objects into an outlet. 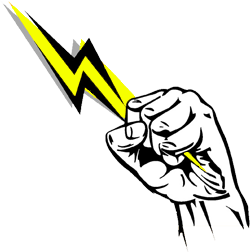 The Electrical Safety Authority recommends that you use a qualified Licensed Electrician to do electrical installations in your home. Apollo Electric is at your service and ready to help you make your home as safe as can be for your children.